Yesterday was a great day here on the Hill. We watched the Dookies lose to Georgia Tech and then we watched and heard the Tarheels in an awesome game against Miami. It was the best game ever! Nicholas needed a pick-me-up because he wasn’t feeling the best in the world yesterday morning. Other than bood sugar issues, he’s had a pretty good weekend. They have added another antibiotic. This one is inhaled through a breathing treatment. He hasn’t been able to tolerate it in the past because he has floppy airways called bronchialmalaysia. With his airways already being this way, breathing the drug would make his airways collapse and he would cough more. They wanted to give it another try because it would put an antibiotic directly in the lungs. Tobramycin is a popular drug and he has taken it through his IV, so we know he is not having a reaction to the drug itself. He seems to be tolerating it pretty well so far. He is doing his regular breathing treatments to open up the airways, then the therapist comes in for his chest pt, and after all of that, he gets the inhaled TOBI. The doctors are hoping this will help to get his lung function back up at least into the 60’s. Nobody likes the fact that they have been remaining down in the 50’s for a while. So today, I am praying for continued weight gain, that the inhaled drug will help to open his airways more, that his lung function will climb higher than the 50’s, and that he can come home on Friday as planned. Thank you all so much for your prayers and support. It means a lot. 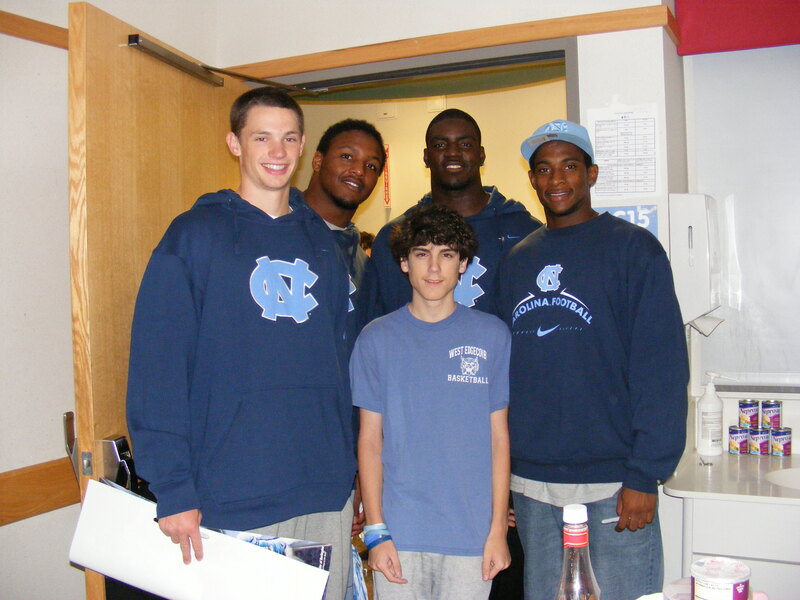 The football players were making their rounds today before the game tomorrow!! It was SO cool! Go Heels!! Things aren’t much different today than they were yesterday. Nick is getting his chest pt as we speak. We are keeping an eye on the weather. There is some baaaad weather going on back where we live. So that’s really all that is going on…other than the fact that this place is stirring with basketball madness!!!! Go Heels!!! Treats come in all shapes, forms, and sizes. Well, today they came in BIG ones. 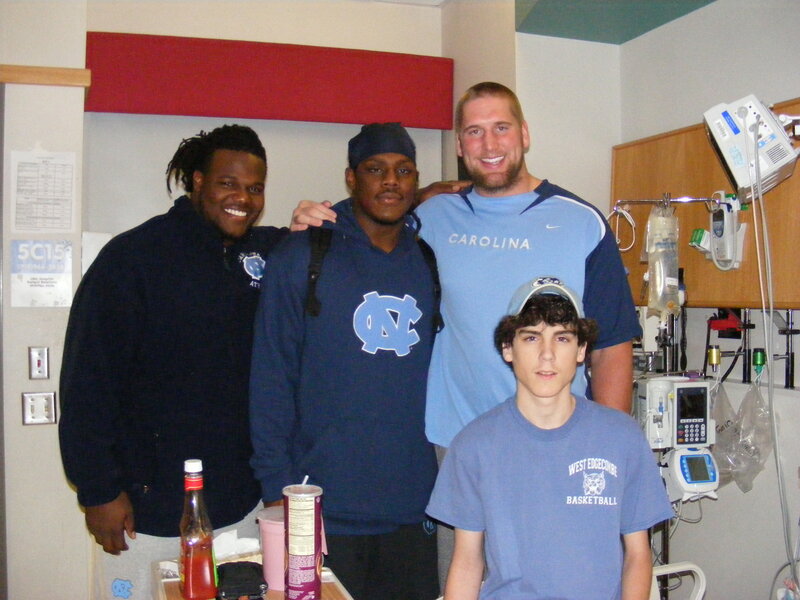 Some of the Carolina football players came by to visit with the children in the hospital. They didn’t even ask us if we wanted them to come – they just said “send them down to Nick Griffin’s room! It was such a treat! One of the guys had made this HUGE play a few weeks ago and when I told him I knew that was him, he gave me this big ‘ole bear hug. It just made my day. These guys were just big, squishy teddy bears. A special thanks goes out to the hospital recreation services, for coordinating visits like these, and to the football players themselves for giving their time to make the day of sick child. (and to an old grandma who is a HUGE fan as well) 🙂 Oh! and they all signed his favorite hat! A special thanks to #42 Robert Quin, #18 Jay Wooten, #9 Marvin Austin, #98 Darrius Massenburg, #75 Garrett Reynolds, #32 Ryan Houston, and last, but not least, #82 Todd Harrelson. These guys were so nice and it seems like a treat for them as well. We wish them the best of luck during their game tomorrow against Boston College. GO HEELS!! !